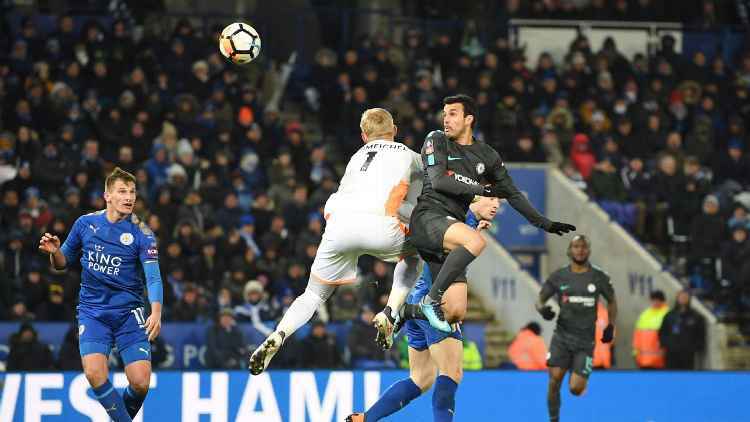 Pedro scored in extra time as Chelsea advanced to the semifinals of the FA Cup with a 2-1 victory over Leicester City at the King Power Stadium. It will be the second appearance at that stage in as many seasons for Chelsea, who lost to Arsenal on penalties in the final last year. Pedro, who came on in added time for Willian, put Chelsea ahead in the 105th minute. A precise chip into the area from N’Golo Kante found Pedro in stride, and he headed home over Leicester goalkeeper Kasper Schmeichel for his seventh goal in all competitions. Chelsea nearly added another in the 110th when Pedro’s cross ended up at Kante’s feet, but the midfielder had his attempt blocked by Marc Albrighton. The visitors were on the board first through Morata, who had not scored since Dec. 26 — a run of 13 appearances in all competitions. Making his first start in three weeks, Morata broke through in the 42nd minute as Willian led the counter-attack and found him with a through ball. Morata, one-on-one with goalkeeper Kasper Schmeichel, slotted home with a right-foot finish into the far side to give Chelsea the lead. Jamie Vardy nearly equalised with a header in the 53rd minute before drawing the hosts level. A cross from Riyad Mahrez from the right corner led to a scramble in the box, and although Vardy’s first chance was blocked by Cesar Azpilicueta — and Vicente Iborra’s attempt was blocked by Andreas Christensen before Willy Caballero saved the rebound — Vardy finished over a diving Caballero for his 17th goal in all competitions. Morata twice nearly scored the winner in the 87th minute, but Schmeichel denied him the first time and then held onto the rebound. Gary Cahill came on for Christiansen in the 101st minute with the defender appearing to leave the game through injury. Leicester were seeking their first appearance in the semifinals since 1982, when they competed in the English second tier.